On the anniversary of the uprisings in Tahrir Square, Global Fund for Women and the Arab Cultural and Community Center presented a special event to reflect on women’s rights amidst Arab revolutions. It took place on Thursday January 26, 2012 in San Francisco, California. The event included three leading Arab women for an evening discussion on advancements and setbacks faced by women’s movements in the region. Speakers included Global Fund grantee partners, Nadia Sraieb-Koepp from Tunisia and Nawla Darwiche from Egypt, and Zeina Zaatari, Global Fund’s Middle East and North Africa Program Director. This event was also co-sponsored by Middle East Children’s Alliance, Arab Resource Organizing Collective and Sunbula: Arab Feminists for Change. It was free and open to the public. “The euphoria of victory last February was palpable,” Global Fund for Women board member Hoda Elsadda writes us from Cairo, “but was soon followed by the sobering realization that you cannot do away with such a corrupt and brutal regime overnight.” While violence continues, women are working together to hold onto their newly won spaces of resistance, optimism and sense of empowerment. 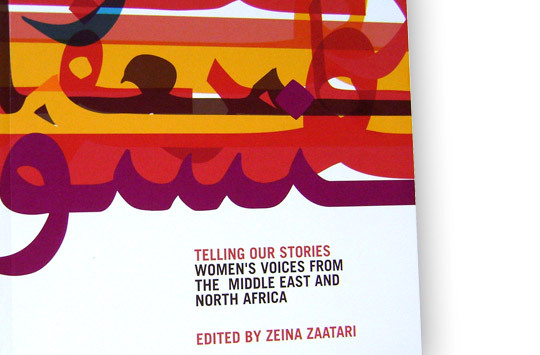 To commemorate the challenges and success of women organizing in the region, Global Fund announces our newest book, Telling Our Stories. Written by key women leaders from the region, Telling Our Stories weaves together history, political analysis, and personal reflections about the rapid political transformations sweeping the Arab world. Gloria Steinem has this to say about the book: "To discover real women behind headlines, YouTubes and Twitters from the MiddleEast, read Telling Our Stories. It's a gift of learning, new friends and knowing that all proceeds go to benefit a democracy that goes beyond patriarchy." You can read excerpts from Telling Our Stories online and they would also be delighted to put you in touch with some of these inspiring women who contributed to the book.